Kenzan, a software engineering firm that specializes in building scalable, data-driven solutions, often leverages DataStax Enterprise (DSE) for customers that have high expectations for both performance and value. That means making careful, informed choices when designing the cloud infrastructure that applications run on. Controlling costs is always a priority for businesses that rely on AWS for running DSE. With AWS, it can be tempting to solve performance issues simply by adding more resources until the problem goes away. However, this “solution” results in increased costs which quickly add up over time. 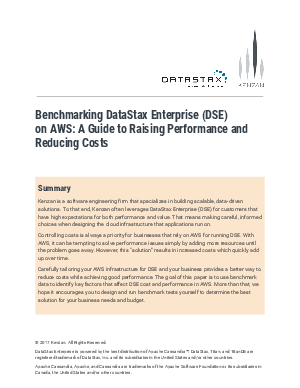 In this white paper, Kenzan and DataStax identify some of the key factors to consider when building out infrastructure on AWS, outlining practical steps you can take to optimize performance with DSE on AWS while keeping costs in check.